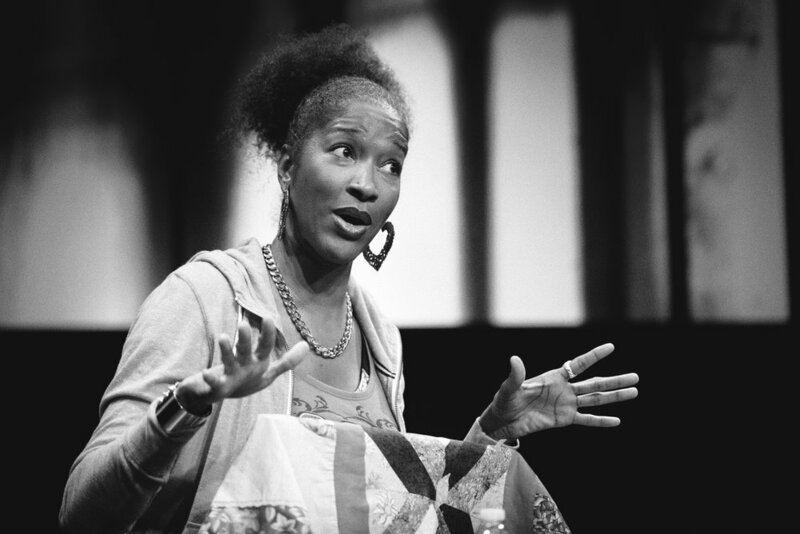 Ourselves Black recently spoke with Liza Jessie Peterson about her new book, All Day: A Year of Love and Survival Teaching Incarcerated Kids at Rikers Island. Ms. Peterson is a poet, playwright, actress, and educator who loves our children and whose experiences have so much to teach all of us about what's broken in their lives, and how to bring healing and recovery to their lives, and to our community and institutions. This published interview is edited for clarity, length, and readability. One of the reasons I want to highlight this is because [in my opinion] one of the reasons why many interventions that people attempt, although well-intentioned, fall flat is because they don’t understand this dynamic [of balance]. You say you had to learn this so talk to me about how you learned it, how you came to understand that this was the effective and proper approach. JLP: My godmother is a clinical social worker at Rikers Island and, she has been working with incarcerated adolescent girls for over 10 or 12 years. But she’s been a social worker for 40 years, and she’s a self-identified social therapist. When I first started working at Rikers Island, working with the girls doing the poetry workshop, she took me under her wing, and that was something she told me. In working with the girls they have a lot they want to share and they’re more expressive in terms of talking about their traumas then the boys are. What I found myself doing initially was just listening to them sharing these horrific stories . I would leave our one-on-one counseling sessions so drained. It was my godmother who pulled my coat and taught me the balancing act: yes, we have to give them room but sometimes the young people have made the wound a part of their identity and so they keep reliving it by retelling it over and over again. While it’s healthy to let it breathe I had to learn through her guidance to also remind them of their resilience and to look forward, to look at their strengths, what they had the power to become [and that] they had the power to transform. So it really came out of me being one of those people who [at first] allowed them to languish in sharing their wounds. I felt helpless…what do I do? I was paralyzed in it. With her expertise and being very unorthodox , she gave me the woundology terminology. So it was really my godmother. By the time I got to the boys in 2008 I had a little bit of experience with the girls prior to that. It helped me navigate with the boys . With Tyquan I loved how supportive the other boys were of him. OB: There’s a portion towards the middle of your book where you speak about how many of these young men lack a foundation upon which to build their lives. Do you feel that the fatherless narrative which we talk about—the statistics about our young men—is being made too much of, or are we on track, based on your experiences with this population? JLP: It’s a mixed bag. The reason I say that is because there were young men who came from two parent families. There were young men who had the father in their life but the father wasn’t with the mother. Or they had a really strong supportive mother…there was one kid who was in high school, he had a two-parent family. He was applying to HBCU colleges and universities, and he got caught up in the street life. Of course having that adult male positive father figure in a young man’s life is definitely going to have a different impact in terms of the fertile soil the child will grow from. But I don’t think it’s absolute. History has shown us amazing people who were raised with single parent moms. Now does that mean there weren’t other men who stepped in to fill in the gap? Probably, but I don’t know. OB: Let’s talk about Rikers. There’s so much mythology around Rikers. Is it really as bad as people think? JLP: The violence that occurs at Rikers Island does happen. There are a lot of people who are getting hurt. So yes, it is bad. However, during my time there I was fortunate enough to know correctional officers who work with the adolescents and who were almost like big brother figures. They were there to guide, also for disciplinary action; that goes without question. But in terms of what they brought to the uniform, their personality, they were black men who saw young black men in crisis. While they had them in their care, they tried to offer words of wisdom. They tried to talk to them man to man. I witnessed a balance. Yes, Rikers is bad. A whole lot of violence. But I also witnessed a lot of correctional officers who worked with adolescents who operated like caretakers. Have I witnessed young people being beaten up by correctional officers? No, I haven’t. Has it happened? Yes, it has. I can only speak to what I saw. It’s chaotic. It’s like any neighborhood that is riddled with crime. People still live there, still go to the bodega , sit on the front porch and have conversations. And then some violence happens and there’s an interruption in the normalcy. So Rikers is like that crime-ridden community where people still live and operate. OB: Were you able to see effects of the strain on the young guys from living in Rikers? JLP: Yes it was the strain of being in a traumatic environment. Being in prison is traumatic. Being transferred to another prison is even more traumatic because now you’re going to a place where you don’t know anybody and you have to restart the process of who to trust. The young men deal with it differently. Some are very quiet, in a depressed state all the time. They wouldn’t talk and [were] very defensive. Using the defense mechanism of ‘I’m not going to engage anybody.’ Then you had those who put up a hyper-masculine bravado as part of their defense mechanism to ward off any predators: ‘I’m going to appear as the predator so I don’t attract any predators.’ Then you had the comedians: ‘If I can be your source of entertainment then I won’t be targeted. They all employed different coping mechanisms to deal with living in a very unsafe and traumatic environment. OB: When it comes to trauma, what would be an effective way to bring trauma-informed care to young people in these kinds of situations? And assuming that it does close at some point, how do we transition people out of Rikers to someplace where this type of care would be possible? JLP: There are a host of reentry programs, and a big component needs to be trauma-informed social workers who don’t languish in the woundology but understand that the behavior is a manifestation of something that happened. So not: ‘why are you like this?”, but: ‘What happened to you?” And to give people the space to be self-reflective so that they can themselves understand where it’s coming from and what triggered it and then what will heal it. And this needs to be at the community level because there are a lot of people dealing with trauma who are not incarcerated, so that it can have a ripple effect into the families. We need therapeutic modalities in our communities so people understand the traumas and not ignore it. Also some people are dealing with complex trauma. So instead of criminalizing people, [we need to] get at the traumas that are playing a part in some of these behaviors that we’re seeing. Much of the dysfunction and pathology we see running rampant in our community is the result of trauma. Poverty is traumatic. Let’s make no mistake about that. We navigate it, and we manage it, but it’s traumatic; it’s stressful. And if you’re dealing with abject poverty—what that does to the spirit and psyche; I don’t think that can be overlooked. OB: Let’s switch to music and media, which you also talk about in the book. Do you believe that some of the people who are producing music, especially in the hip hop space, are living out some of their own trauma? JLP: Absolutely. Some of the videos that I was able to watch when I worked with the adolescents in the Rikers Island housing area, these videos were so packed with pathology. It was stunning. But I said, ‘Wow they’re talking about their experience, they’re talking about their trauma.” It was very disturbing. What’s equally disturbing is that we’re only getting that narrative which is the only one that’s getting access to our children—the narrative of trauma. Not the narratives of healing, not the narratives of resilience, not the narratives of empowerment. We’re only getting the narrative of death, of self-hatred, misogyny. There’s no balance. There’s not a complete conversation. OB: Do you think someone like Chance (the Rapper), or Kendrick (Lamar), people like that, are trying to do some of this work of changing the narrative? JLP: Definitely. And I think there are others like them: Lupe Fiasco, J Cole who are telling a complete story and they’re coming with a more empowering narrative, more complex. It speaks to liberation, to self-reflection and self-analysis, even community analysis. So there’s analysis there which is so important. They’re helping to push the culture in a direction of healing and wellness, not just profiting from these corporate colonists who have colonized hip hop. Because hip hop has been colonized, make no mistake about it. OB: Please explain that. What do you mean? JLP: There are corporate entities who have a vested interest in maintaining the narrative of our destruction. Promoting and green-lighting it. These are people who don’t have our best interest [at heart], and they have infiltrated our sacred art. They have gatekeepers who have shut the gate on a full conversation and on the complexity of our voices and have only allowed or given access to the voices of destruction and ignorance, voices of minstrel. You can buy her book at Amazon.com, BarnesandNoble.com, or the publisher's website. So the music does play a critical role in our health and development and healing, [and also in] exacerbating our trauma.